The holidays require many decisions. Real or artificial? Colored lights or white? Red bows or green? Which cookie do you make for the cookie exchange? Do you send a photo card or a regular card? Include a letter? Maybe you just won’t send cards this year. What do you get little Susie? Little Johnny sure has grown, will he need a large or extra-large? Do you serve beef or turkey? My family has struggled each year for the past four years about how to spend the holidays given my mother’s illness. It doesn’t seem to get any easier. The first Christmas after her two consecutive broken hips, she was in the skilled nursing facility for rehab. I remember calling my sister and sobbing on Christmas Eve morning. I had gone to the facility early in the morning, with my little dog who usually made my mother smile. I brought a plate of home-baked cookies and I planned to go pick up mom’s favorite fast food for lunch. I hoped to spend the day with her and make her Christmas Eve as pleasant as possible. She greeted me with venom. She spewed that this was my fault, that I had put her there and that it was I who was mean, and cruel and wanted her to be miserable. No matter that this was completely and absurdly untrue, I was exhausted. Her health and her care had dominated my life for two months. I felt guilty that she could not be in her home or even in mine but she was not well enough. I sat in my car sobbing as I relayed the morning’s conversation to my sister. She listened, commiserated and after a while, I was calmer and felt that I could face the wrath of my mother once again. The next year, we took my mother to my sister’s home in a city four hours south for Christmas. Mother wakes up many times during the night so my sister and I took turns sleeping in mother’s room. Then on Christmas Eve mother came down with the virus that had been running rampant at her assisted living and we had presumed she had missed. Changing her pajamas and the sheets in the middle of the night, cleaning her up and dealing with the mess and the smells was NOT what we had hoped for from Santa. Then, 24 hours later, I succumbed to the same lovely intestinal virus and shortly thereafter, my sister. That year, the phrase “Bah Hum BUG” had special meaning. The next year, the family traveled here and last year we made the trip south with my mother. We hired caregivers from an agency to be with mother at night so my sister and I were able to get good sleep. No one got a bug. The biggest challenge was the actual trip itself. Holiday traffic, heavy rain, a wheelchair and bathroom stops do not mix well. This year my mother’s condition has been a roller coaster. She has had very good days, and some very, very bad days. She is not as strong as she was last year. My sister and her children could travel to us. But to complicate things, there is now the cutest 18 month old grandson in the world living in the city in the South. His “Gampa” and I want nothing more than to be with him on Christmas morning. Unfortunately, his other grandparents, our son-in-law’s parents, are traveling from their home in Europe to be with him this year so my daughter cannot possibly travel here to be with us on Christmas. There have been numerous phone conversations. We have discussed a variety of scenarios. We have consulted Mother’s doctor. The bottom line is, this year no solution is going to be ideal. And the fact of the matter is, the biggest challenge we are facing is the big G – Guilt. That big G is the enemy of every caregiver. It consumes, it steals sleep, it usurps joy, and in effect, can bring a caregiver to his or her knees. It’s not just about holidays, guilt is the cloud that looms over living arrangements, medical decisions, financial decisions, vacations, family celebrations, relationships and so on and so on and so on. It becomes a constant struggle. And no matter that every book on caregiving and every professional who works with caregivers says “Do the best you can – then let go of guilt.” I ought to know, I have given that piece of advice to hundreds of caregivers. But it is so much easier said than done. I don’t have any sage advice for you Sandwiches this Christmas. I am struggling like so many of you. What I can do is once again say that you are not alone. I am right here with you, climbing the mountain, fighting the big “G” of guilt and daily trying to decide what to do about some aspect of my mother’s care and well-being. I can also pray and wish for you less guilt and more joy this holiday. For me this season is a reminder of the promise of a better place, a better life – one where we will ultimately be free of pain and guilt and where our loved ones will be healthy and whole. But no matter what your personal or spiritual belief, as we move toward the end of 2014, I wish you strength. Feel a hug from me. And eat some chocolate. 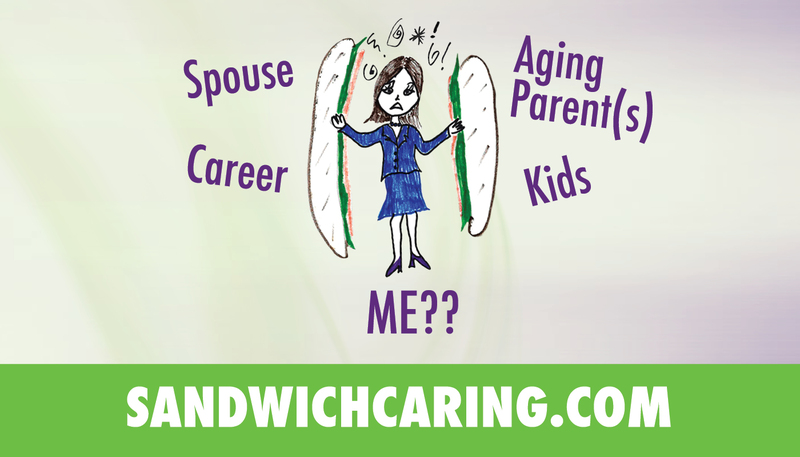 This entry was posted in caregiving, dementia, life challenges, parents, planning for the future, sandwichcaring, Uncategorized and tagged aging parents, caregiving, dementia, health care on December 22, 2014 by janestory.